When you need a meal but don’t have time to cook, what do you grab? It can be a delicious dish filled with good nutrition. Simply pick one day a week that you have 20 minutes or so to spare – perhaps Sunday evening – and whip up a meal (or more!) that can be frozen for later. It’s ideal if you need to cook for just one or two; you’ll be able to take the exact serving of what you need out of the freezer. If you’re cooking for four, you’ll also find family-style recipes here. The best part is that all you need to do is put the frozen meal into the oven or microwave, set the timer and go about your business until it’s ready. Then, of course, enjoy! You don’t need to go to a fast-food drive-through window to get a speedy breakfast sandwich. You can head over to your freezer, take out one of these savory goodies and pop it into the microwave for two minutes. Wow, that’s faster than going the fast-food route! Better yet, it’s packed with great taste, balanced nutrition and natural ingredients. 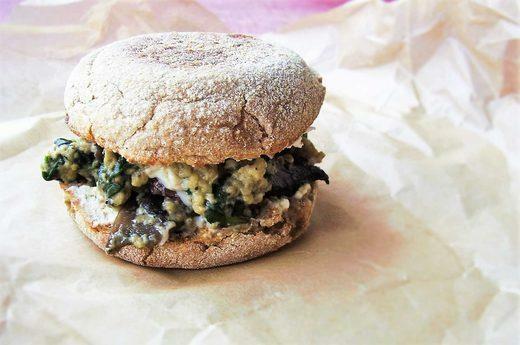 Each whole-grain English muffin is spread with goat cheese and stuffed with a scrambled mixture of eggs, portobello mushrooms and baby spinach. It’s an easy way to get veggies in the morning – or any time! CALORIES: 272. Get the recipe here. Every region in the United Sates has its own preferred chili. In Ohio, Cincinnati chili is popular. It’s basically a uniquely spiced, meaty chili served over spaghetti, then topped as you like with Cheddar cheese, beans and onions. This recipe is a better-for-you version. 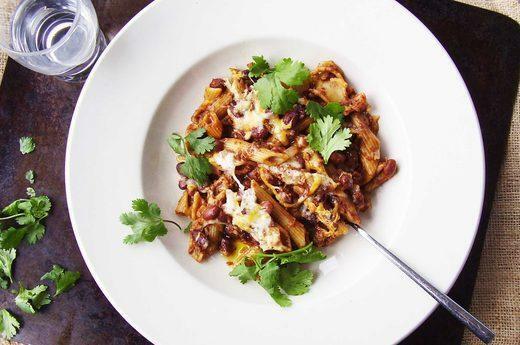 It’s baked with layers of whole-grain penne, Cheddar cheese, red onion and vegetarian chili that’s “spiked” with red wine vinegar, cinnamon, cocoa powder and allspice. It’s an antioxidant winner! And it’s a winner for dinner on any given day because all you need to do is take the dish out of the freezer and bake it. That’s it! CALORIES: 471. Get the recipe here. You can pick up the phone and order Chinese takeout, or you can pull this rice bowl out of the freezer and have a delicious mealtime fix – fast. Instead of greasiness, this colorful vegan bowl is loaded with plant-based delightfulness. Brown rice is combined with orange zest and fresh cilantro. 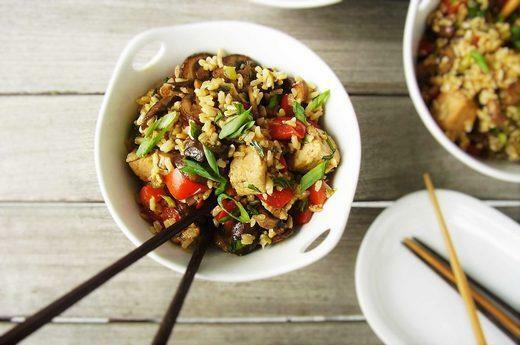 Organic tofu is stir-fried with baby bella mushrooms, red bell peppers and scallions. A savory sauce of tamari and toasted sesame oil scrumptiously brings everything together. Each bowl takes less than five minutes total from freezer to microwave to table! CALORIES: 528. Get the recipe here. 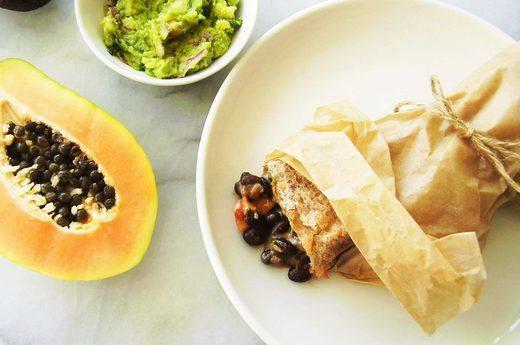 This is not your run-of-the-mill burrito. It has a taste of the tropics by way of vitamin C-rich papaya. Each sprouted whole-grain tortilla is also stuffed with baby spinach, black beans, spicy salsa, scallions and fresh cilantro. To bring it all together in a mouthwatering way, don’t leave out the Monterey Jack cheese! From the freezer, each burrito takes only three-and-a-half minutes to heat in the microwave. That’s downright fast! But then it’s time to slow down and savor every bite with a fork and knife. CALORIES: 296. Get the recipe here. 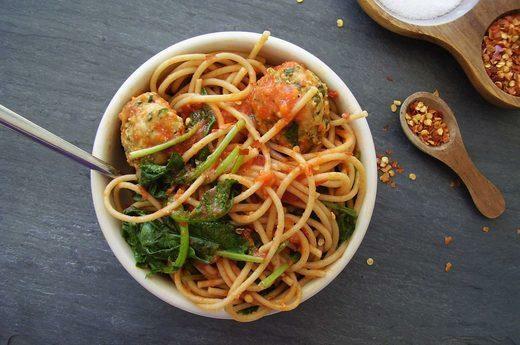 Spaghetti with meatballs is a classic. This pasta bowl takes that classic and kicks it into a trendier place. The meatballs are based on turkey, kale and hemp seeds. The pasta is whole grain. It all goes together to make one great-tasting, nutrient-rich bowl of goodness – and a fun way to get lutein (from kale) and lycopene (from marinara). To prepare, you’ll bake the meatballs while you cook the pasta, toss it all together with a quality marinara sauce, transfer to bowls and freeze. Each bowl will be ready to eat after four minutes in the microwave! CALORIES: 563. Get the recipe here.